Some of the most popular silver coins and silver bars for sale online in North America are produced by the Royal Canadian Mint (RCM). These beautiful, low-premium coins from Canada are recognized around the globe. From the iconic Maple Leaf to specialty issues such as the “Wildlife Series,” these coveted coins offer some of the most reasonable premiums of any Government Issue bullion. Learn more about coins from the Royal Canadian Mint and how their pricing and special production processes make them a great investment option. All of the circulation coins produced in Canada come from the Royal Canadian Mint. Plus, they manufacture coins on behalf of other countries. Additionally, the mint designs and makes coins made from base and precious metals. This includes medals, medallions, and tokens as well as palladium, silver, gold and platinum bullion coins. 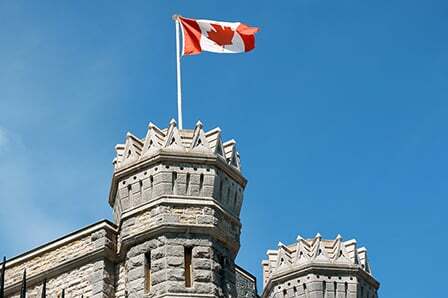 As a Canadian Crown Corporation, the Royal Canadian Mint is completely owned by the Government of Canada, its sole shareholder. The Mint's facility, with an historic location in Ottawa and a refinery plant in Winnipeg, produced more than 1 billion circulation coins last year. The presses can make over 20 million coins daily. An avid collector recognizes they also issue special circulation coins to commemorate events and occasions, such as the Vancouver Olympic mascot coins. While the Royal Canadian Mint produces an incredible number of circulation coins, they also make collector coins. Each numismatic coin the Mint designs is made to honor national themes, games, and milestone moments – as well as for the military. These coins bear a dollar denomination, but are not produced for circulation. As a result, they typically have a worth that is much more than their face value or legal tender value, unlike medals and tokens. Some coins feature unique coloring, selective plating, laser enhancements, or double holograms. The Mint also makes a variety of gifts, including coin sets, jewelry, and medallions. From a special medal to keepsake coin sets, there are a variety of items available to appeal to anyone, including nature buffs and sports enthusiasts. Recently medals were produced for the Vancouver 2010 Olympic and Paralympic Winter Games and the Toronto 2015 Pan Am and Parapan Am games. Each gift highlights a moment in time, including Canadian events and occurrences as souvenirs to help support tourism. From the packaging to the presentation, the customer is satisfied every step of the way. One of the most effective ways to build and protect wealth is investing in gold and silver bullion. The Royal Canadian Mint produces a variety of bullion Maple Leaf coins as well as trade bars, gold wafers, and gold kilo bars. They all bear the distinctive Royal Canadian Mint hallmark for guaranteed authenticity at a surprisingly competitive price. The Gold Maple Leaf (GML) coins are among the most popular among smart investors, particularly the 1 oz size. The Mint also produced a 100 kilo version of the 99.999 percent pure Gold Mint Maple Leaf coin as a promotion, and it was later sold as a product because there were numerous interested buyers. In 2007, the Mint produced 99.999 percent pure Gold Maple Leaf Bullion coins, which were the first in the world. These limited edition, one troy ounce gold bullion coins were offered in a limited edition form in 2007, 2008 and 2009. The Royal Canadian mint produces coinage for many foreign countries. This includes blanks, circulation coins, and numismatic coins. The Foreign Circulation division was re-launched in 1970 by the Master of the Mint, Ward Hunter. The first contract was won for Singapore in 1970, to produce rimmed blanks in a copper-nickel alloy. The next contract was with the Central Bank of Brazil. Other countries which asked the Royal Canadian Mint to produce various types of coins include Jamaica, the Bahamas, Iran, and Venezuela. Currency has been produced for a number of countries, including pesos for Colombia and the kroner for Norway and Iceland. Customers who needed money minted over the decades have included treasuries, governments, and central banks. The Royal Canadian Mint first produced its own branded bullion coins in 1979. They featured a Maple Leaf on the reverse. Over time, the fineness of the gold used to strike these coins has increased. Special edition coins have been released, including one for the 125th anniversary of the RCMP in 1997. The Mint has also produced a limited number of palladium and platinum Maple Leaf coins. From 2005 to 2009, Palladium Maple Leaf coins were offered. Platinum Maple Leaf coins were struck in various weights between 1988 through 199 and again in 2009. Special issue sets have also been minted. One of the most recognized coins among investors around the globe is the Royal Canadian Silver Maple Leaf (SML) 1 oz silver coin. They are an excellent choice for investors. Often these coins depict wildlife. They have been sold in sets and individually. Animals featured on the coins include the grizzly bear, wolf, Arctic fox, and Canadian lynx as well as the moose, cougar, and wood bison. Many satisfied investors have purchased and sold Silver Maple Leafs because of their affordability and availability. Knowing the solid history of these coins gives buyers the confidence to invest in Silver Maple Leafs. Innovation and superior design make these notable coins a top choice for all types of investors. Consider investing in the latest in the series; include one that features a red-tailed hawk and another that features a bald eagle. Contact Money Metals Exchange anytime to learn more about investment coins manufactured by the Royal Canadian Mint. Experience the total satisfaction of investing in coins from the Royal Canadian Mint. Our services are secure, discreet, and cost-effective. We help beginners learn more about investing gold and silver bullion and work with seasoned investors to alert them about the latest investment opportunities. Contact us today!